After eating a lot of Mexican, Chinese and Indian food over the holidays in the US, my taste buds were craving for something different. Just as tasty as all these cuisines but with the use of a few different ingredients. 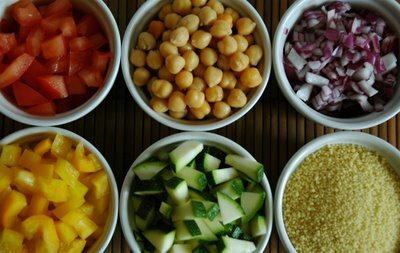 As I surfed some of my favorite blogs (boy does that feel good) I came across Pam's Middle Eastern menu. She used couscous. Which straight away took me down memory lane of when I was living in Doha, Qatar. I love Middle Eastern food. The use of their fresh ingredients and spices gives this cuisine the right kick. I had not made couscous for absolutely light-years and decided that whatever i did make it would contain couscous. I sat down and started making a list of things that I can prepare with the couscous. As it is so hot my initial idea of serving this with meat went out of the window. Tom then said "Just do the couscous!" "Great idea, honey .... here are 1001 kisses from my couscous!" I chirped and thought "why did I not think of that!" It is quick, easy and perfect for warm days and can be eaten hot or cold. Not to mention it makes a great dish to eat in front of the TV watching the soccer matches. Are you all watching? A few great matches going on there. Tom is just about collapsing at the soccer everywhere he goes. He is not really such a big fan and just rolls his eyes when I constantly have the TV tuned in to one of the matches. Anyway, let me take you into my oriental world and serve you my Arabian style couscous with a touch of rose-water! In a large pot bring the chicken stock to a boil. Remove from heat and add the couscous. Mix well, then allow to swell for approx. 2-3 minutes. In the meantime in a large frying pan heat up some olive oil and fry the onion and garlic until soft. Add the zucchini and peppers and roast till slightly brown. Now put in the chickpeas and continue to simmer gently. Loosen the couscous with the fork. Place back on a slow heat and add a few chunks of butter. Stir until the butter has melted. In the vegetables add the tomatoes, oregano, herbs of the provence, salt. Sauté this just for a few minutes. 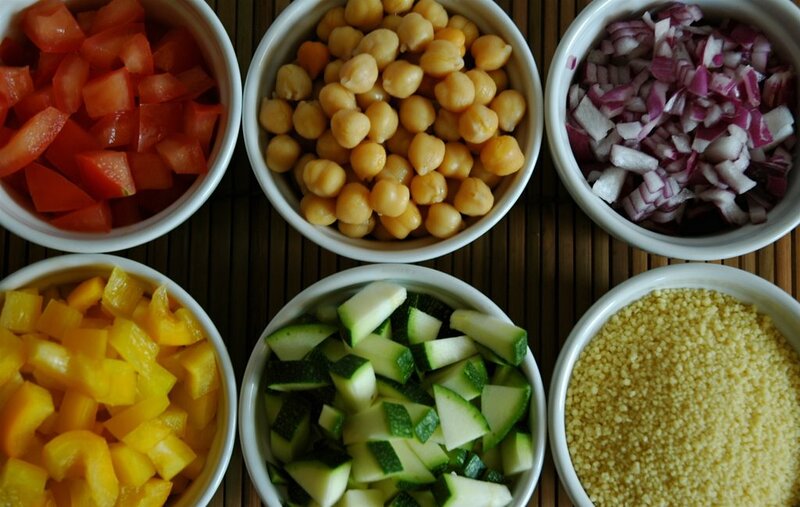 Now add all the vegetables to the couscous and incorporate well. Sprinkle the chopped chives and coriander leaves and mix well. Lastly add some salt to taste and a few drops of rose water. Serve in large plates with a sprinkling of olive oil over the top. This is just one of those dishes that you know you are going to get "ummmmm"s and "aaaahhhh"s to. And it did. Tom was surprised at how easy and tasty this was to make. I even had time to take a few pictures for my photography group (I'll share those with you later). Soeren ate the biggest bowl and wanted to take some with him in his tiffin but I am not too sure how the teachers will take it when Soeren starts eating something so aromatic (garlic was great) for breakfast!! Firstly, really sorry about missing your birthday darling- just happened to see that today! Sending you many warm wishes for a wonderful year ahead. Your couscous looks divine, i just had that last weekend in a Moroccan Restaurant called Momo's in Central London. Being vegetarian the best thing for me to eat was a couscous with a vegetable curry. But over 10 quid for that dish seemed a bit steep- but that's how central london is i guess! Back to blogging and a great football round up- kind of underweather since I've returned, but will be regular soon! Looks wonderful Meeta!!!! My mouth is watering!! I do make this . Yummy recipe and beautiful photos. Looks delicious and so healthy !! Meeta, welcome to Weekend Herb Blogging. Great to have you participate. 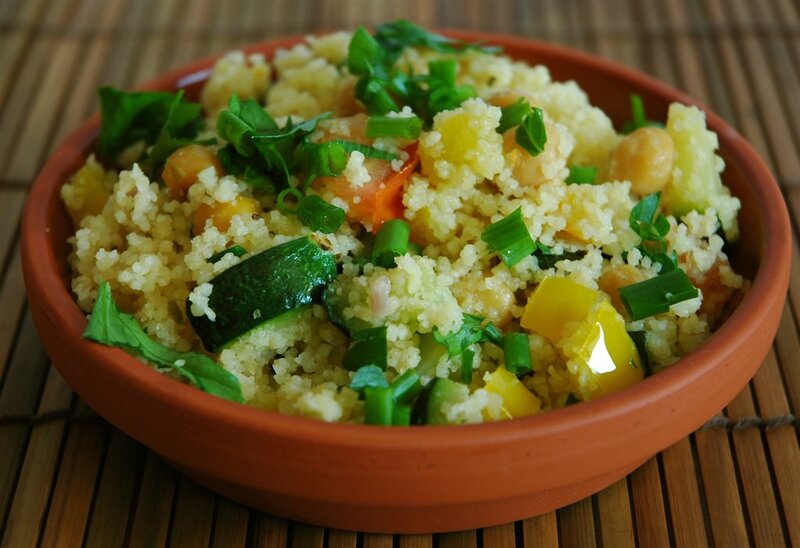 The couscous looks just wonderful. Meeta - you've been tagged :) But dont do the meme if you dont want to! Mmmm - looks delicious, and has given me good inspiration for tonight's dinner! Nandita, good to have you back and thanks for the wishes! Vineela, thank you. Hope you enjoy it! Krithika, it is healthy. The best thing is the Soeren wanted the leftovers for dinner the day after again. Shammi, another meme - a nice one this time though. Will see if I can manage it! Hester, please do let me know what your verdict is! I LOVE couscous. I've never thought of putting rose water in the dish though, and since I love rose water as well, I am going to give this a try this weekend. Have you tried this with toasted pine nuts? Great post! 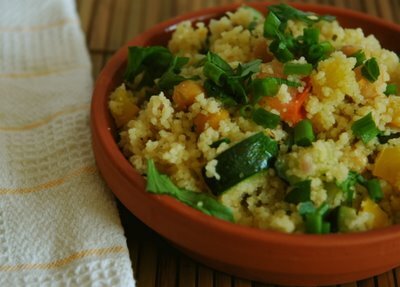 Your couscous looks fresh and so inviting. Mind if i take a couple of spoonful?